Are You Missing This Key Strategy In Your Family Preparedness Planning? This teaching strategy is what’s missing in your family preparedness planning. ReadyNutrition Guys and Gals, I’m sure you may recall the expression “Don’t stop the training!” either from your days in scholastic sports or if you were in the military. Keep that expression in mind, every day, and I wish to make a suggestion to “spice” up the training just a tad bit. The concept is referred to as cross training or station training, also known as “Round Robin” in the vernacular. Station training is a good technique to use to involve the whole family in something, and shower “kudos” on one another with good performance. Here’s the Key: Everybody in the family participates as a student and as an instructor. If you have a “family day,” or a particular day off when everyone is together, that would be the perfect opportunity. Make 1-2 training “blocks” for blocks of instruction. One instructor per block, with the instructor being one of the members of your family. Yes, Readers, you read that correctly. 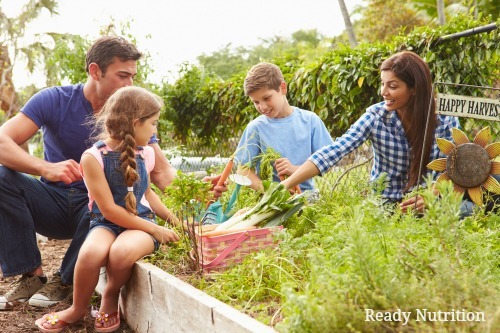 Here’s the scoop: After accessing your family member’s strengths, have them discuss the survival skills that each of your family members excels in, and have them develop a plan of instruction during the week prior to that family day…when they will serve as the instructor for the rest of the family. This is pure participation at its finest. Granddad may be an excellent mechanic. Have him give a crash course on how to hotwire your car in an emergency, and how to do simple repairs and maintenance. Big Sis may be a brown belt in Judo. Have her instruct on the finer points of one or two holds, or one or two basic kicks. Mom is a green thumb. How about a short course, Mom, on seed-saving, and the differences between annuals and perennials? Dad is an artist. How about a short course on drawing, Dad, and making basic sketches and renderings? Could come in handy when you’re outdoors and need to make a map, or analyze a course of action for a means of escaping a natural disaster. There truly are unlimited amounts of subjects. Use visual aids, such as power points or computer displays to reinforce what is being taught. After the instruction, everyone should come away with a good idea on the basics of something they may or may not have ever seen or tried before. This can help them face a fear or learning a new skill all together. The only limits are your imaginations and the amount of dedication that you have to make the training productive. Get everyone involved. Everyone is different and there is no hard and fast rule on who can teach according to age; however, try to keep it starting out for kids to instruct if they’re about 14. The younger ones will see this and wish to emulate their siblings. With time, give them a chance, and give them a simple task to do to enable them to have the experience of teaching something. To do things together as a family that will facilitate your bonding and also help with your chances of survival when the time comes. Do all of this training in a good-natured manner, but be serious about it and be “professional,” that is take the time to have the correct resources and setup (tables, chairs, visual aids, and materials to demonstrate/perform the training function). It is a total win-win scenario if you undertake it. A lot better than just sitting in front of the television, or “going out” to the great “nothingness” of the shopping mall or a movie, this situation training will allow everyone a role…helping them to feel an important part of something, which they are…a part of your family. Try it out, you’ll like it and it’ll give everyone something back…for now…and as a prep for later when the SHTF. JJ out!